Main purpose of this report is to analysis SME Loan Lending Activities and Reconciliation Process, here focus on BRAC Bank Limited, Head Office. other objectives are find out basic appraisal of SME loan and know the enterprise selection criteria to provide SME loan. Report also focus on to know the disbursement and recovery procedures of SME loans. Finally analysis the work process and monitoring system of Central Support, Operation Help Desk and Reconciliation and make some recommendations on the basis of relevant findings. This is a descriptive type of research that’s why I would mainly take an analytical approach on my report. Both primary and secondary sources have been used for data collection. All officers, executives and customers of BRAC BANK LTD, Head office as well as all employees and customers of seven unit offices located in Naogaon, Jaypurhat,Chokoria, Khagrachori, Rangamati,Rajshahi, Porsha. Visit in different unit offices located in different districts in Bangladesh. A fully operational Commercial Bank, BRAC BANK LIMITED focuses on pursuing unexplored market niches in the Small and Medium Enterprise Business, which has remained largely untapped within the country. In the last five years of operation, the Bank has disbursed over BDT 32,188.26 million in loans to nearly 67047 small and medium entrepreneurs in 2009. The management of the Bank believes that this sector of the economy can contribute the most to the rapid generation of employment in Bangladesh . The Bank’s footprint has grown to 71 branches, 429 SME unit offices and 225 ATM booths, 30 cash deposit machines, 1558 POS terminals, 19 utility services bill payment booths, 1900 remittance delivery points across the country. In the years ahead BRAC BANK LIMITED expects to introduce many more services and products as well as add a wider network of SME unit offices. Building a strong customer focus and relationship based on integrity, superior service. To value the fact that they are the members of the BRAC family – committed to the creation of employment opportunities across Bangladesh. To mobilize the savings and channeling it out as loan or advance as the company approve. To establish, maintain, carry on, transact and undertake all kinds of investment and financial business including underwriting, managing and distributing the issue of stocks, debentures, and other securities. To finance the international trade both in import and export. To develop the standard of living of the limited income group by providing Consumer Credit. To finance the industry, trade and commerce in both the conventional way and by offering customer friendly credit service. To encourage the new entrepreneurs for investment and thus to develop the country’s industry sector and contribute to the economic development. medium entrepreneurs do not have easy access to get loans from the commercial banks/ financial institutions. 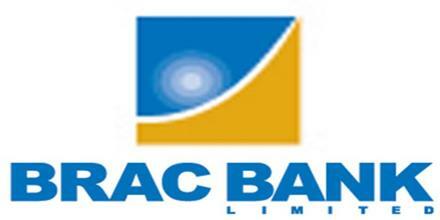 But BRAC Bank Ltd. Provides loans ranges between BDT 3 to 8 lacs without any kind of mortgage. The respective unit office sanctions loan to the client if it is 2 to 5 lacs, and then sends the sanction letter including all necessary charge documents to the loan administration division for disbursing the loan. If the amount is higher than 5 lacs then the respective unit office sends the proposal to SME, head office for sanction. The head of SME sanctions the loan and sends the sanction letter including all documents to the loan administration division for disbursement and inform the respective unit office regarding sanction of the loan. Documents deficiency and problem resolving: If there is any error found then it informed to the respective CRO. If the application form is not filled properly then the file send to the CRO to fill the application properly. If any document error found then the loan administration division asked the CRO to send the require documents and the file stored to the loan administration division. Disbursement of the amount: Sending the list to the treasury of BRAC bank for disburse the amount, the treasury disburse the amount to the client through the mother account of the clients bank. BRAC bank disburse amount through any of the following banks corporate branch nearer the BRAC bank head office and the corporate branch of the respective bank send the amount to the client account in the respective branch.